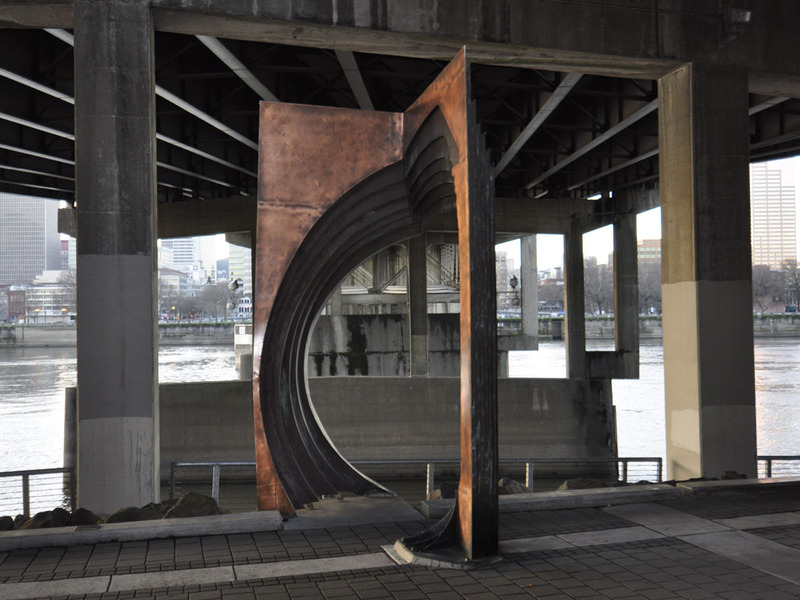 Size: Echo Gate- 13’h x 9’w x 7’d , Ghost Ship-9’h x 7’w x2’d , Stackstalk- 25’h x 2’w x 2’d , Alluvial Wall-13’h x 12’w x 3’d. 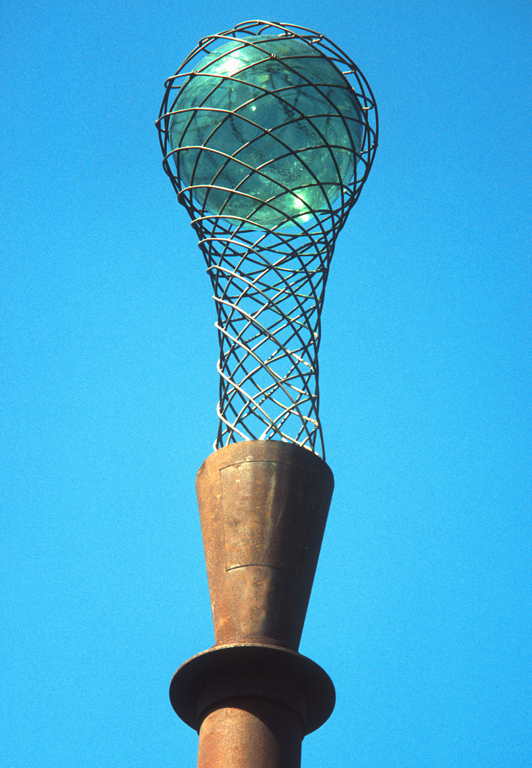 Materials: concrete, weathering steel, bronze, copper, patina, stainless, laminated art glass, glass float, lighting. 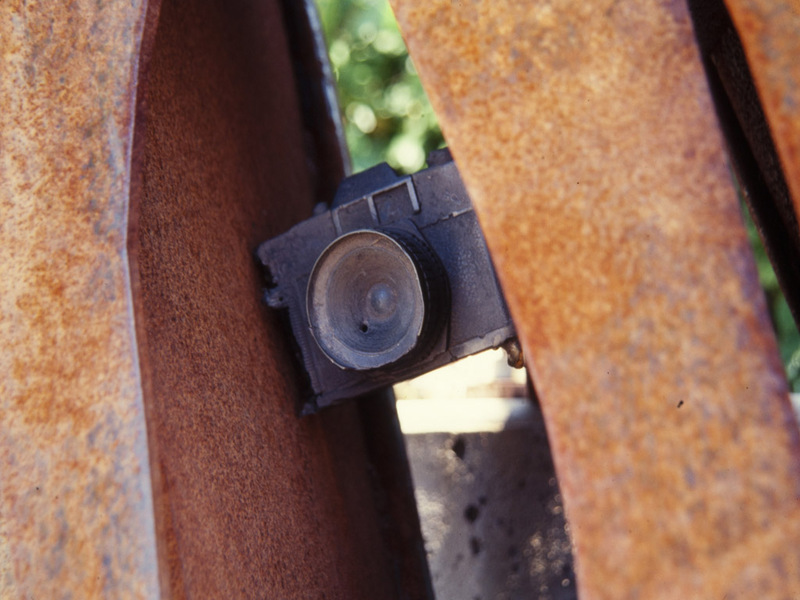 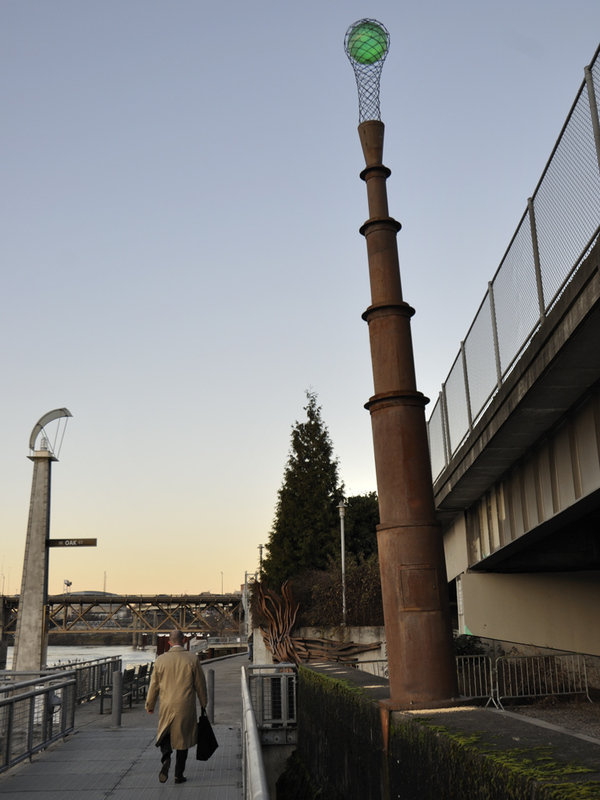 Situated between Interstate 5 and the Willamette River, the sculptures mark the blurred boundary between the natural and human-made aspects of the site. 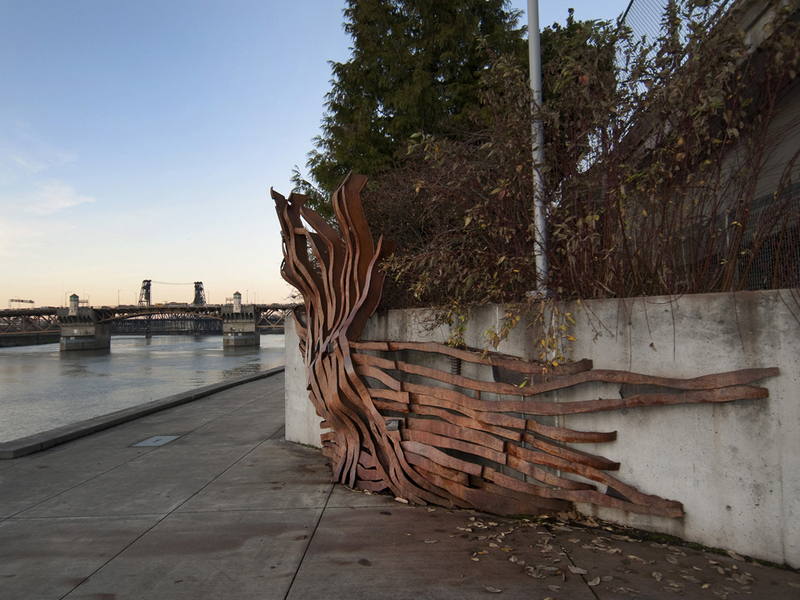 RIGGA proposed to create a series of “sculptural knots and ghosts” which would reflect the riverbank’s interwoven urban and natural history. 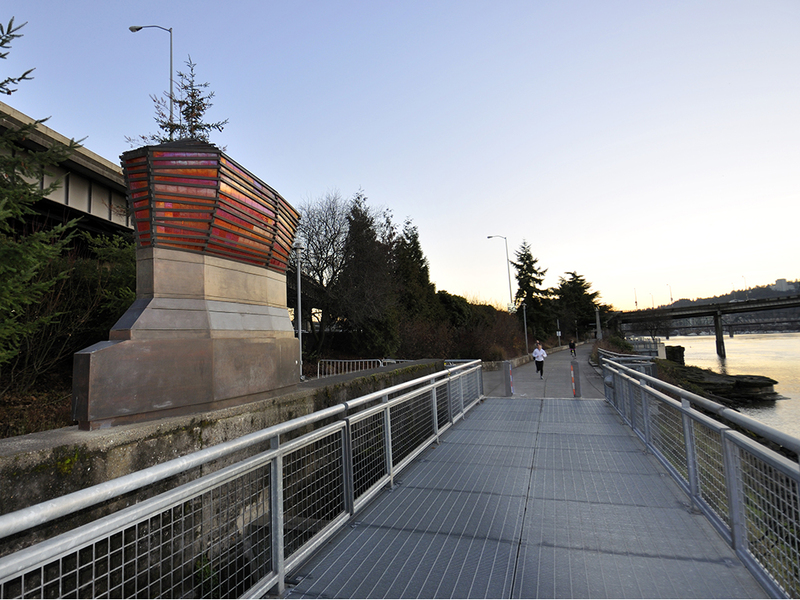 Echo Gate is a gate oriented to both the pathway and the river. 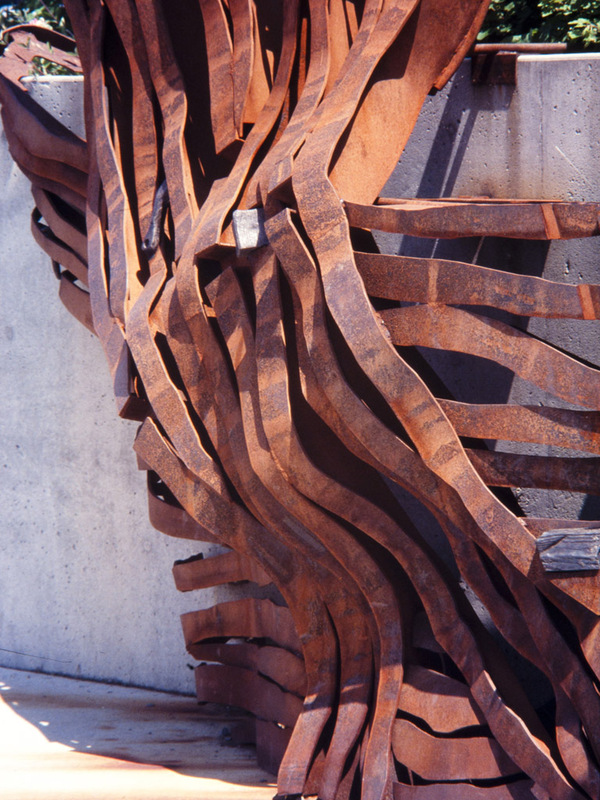 A sculptural hybrid echoing past pier buildings and marine barnacles, it becomes both crenellation and crustacean. 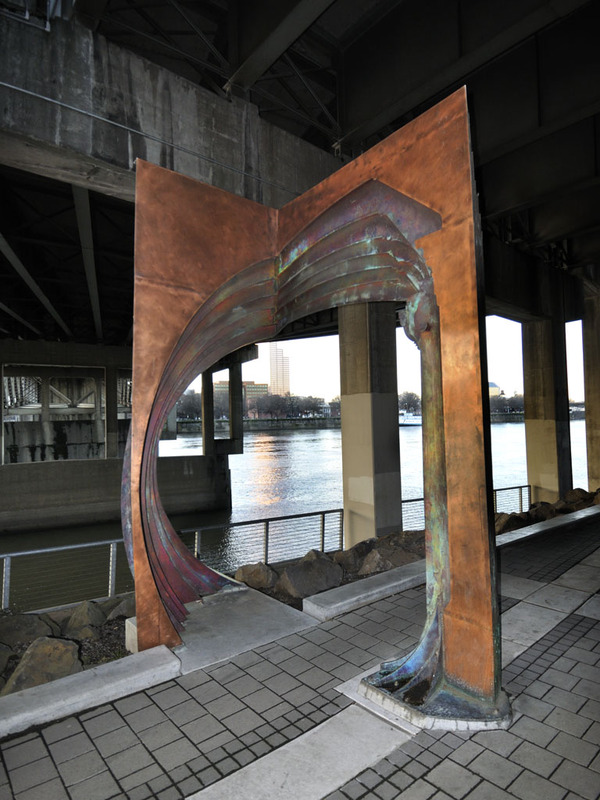 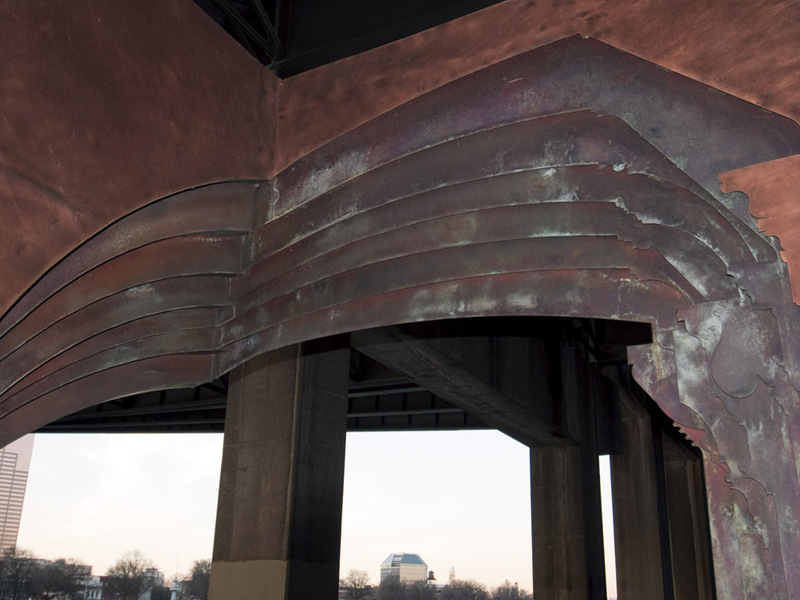 The sculpture suggests bending an ear to the river amidst the rushing decibels of the freeway. 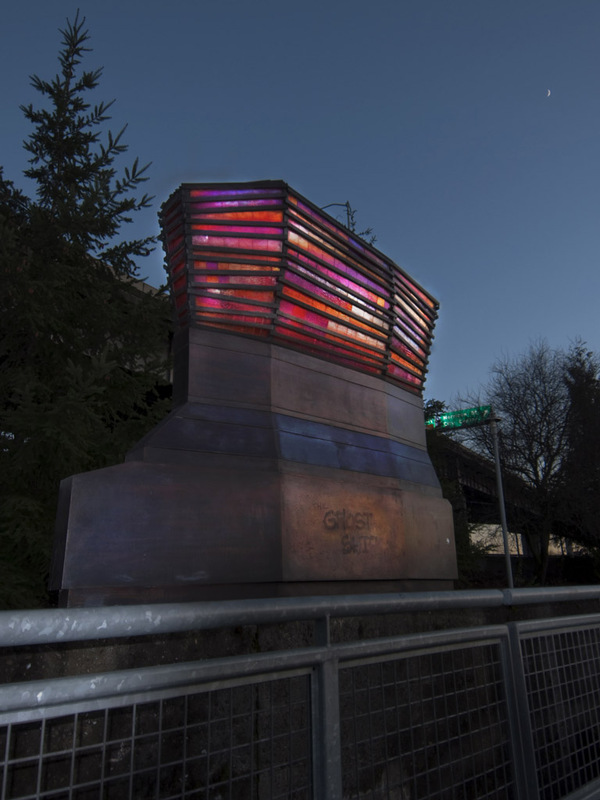 Ghost Ship recalls Portland’s maritime history; it is a sculptural ghost illuminated from within, a beacon from the past marking the rivers edge. 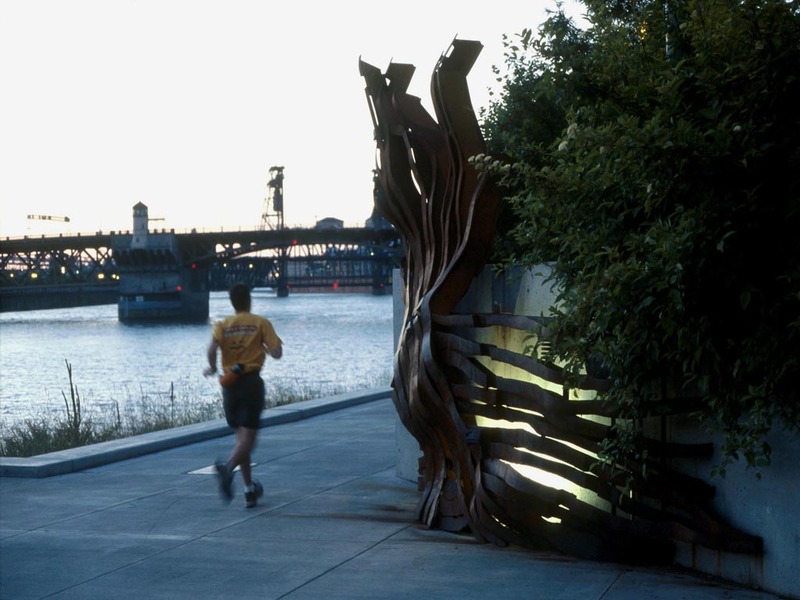 Stackstalk pays homage to the hybrid nature of the river-port as a meeting point for eastern Oregon’s agriculture with ocean bound ships. 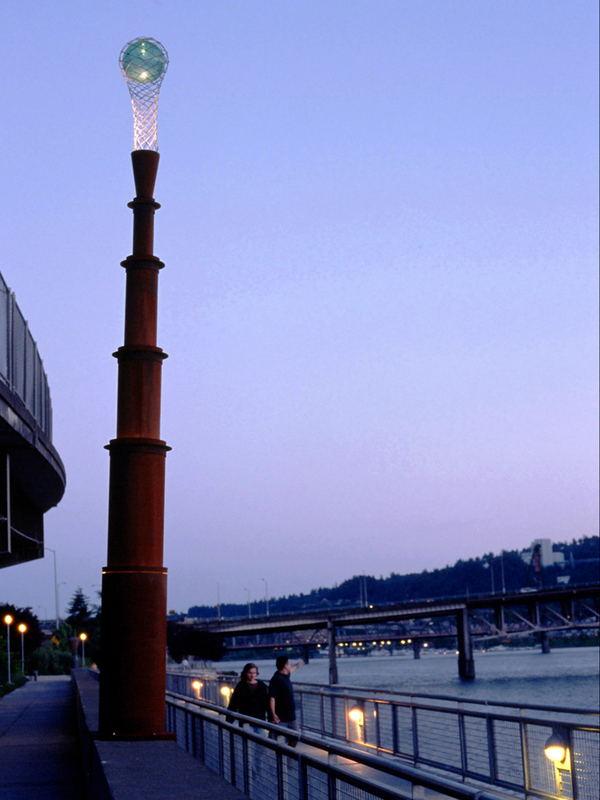 Blending a stalk of barley with a rustic smoke stack, it suspends a Japanese glass float in the sky as a reminder of the rivers connection with the Pacific Ocean. 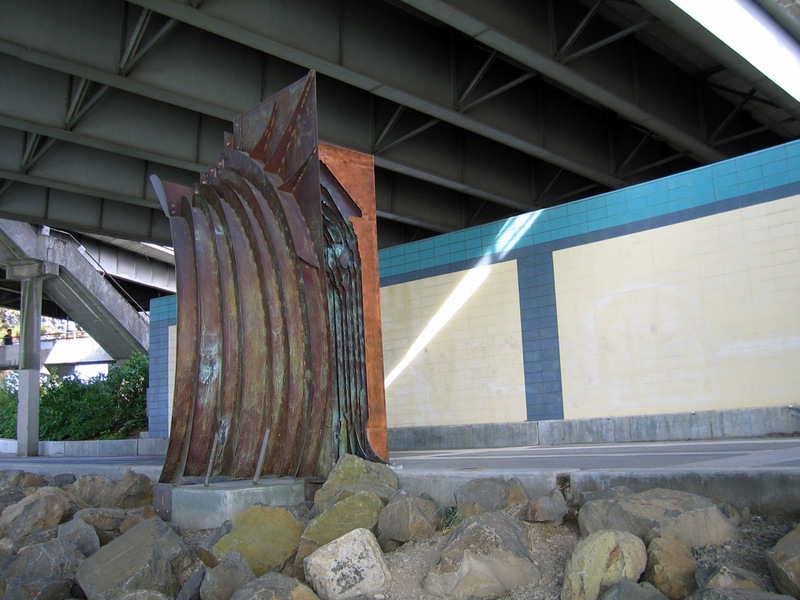 Alluvial Wall alludes to the interwoven layers of the rivers pre-industrial alluvial geology and industrial infill, eroded by light and filled with cultural sediments, to be discovered by passers by.